A high-quality computing education equips students to use computational thinking and creativity to understand and change the world. Computing has deep links with mathematics, science and design and technology, and provides insights into both natural and artificial systems. The core of computing is computer science, in which students are taught the principles of information and computation, how digital systems work, and how to put this knowledge to use through programming. Building on this knowledge and understanding, students are equipped to use information technology to create programs, systems, and a range of content. Computing also ensures that students become digitally literate—able to use, and express themselves and develop their ideas through information and communication technology—at a level suitable for the future workplace and as active participants in a digital world. ﻿An algorithm, in simple terms, can be understood as a list of well defined instructions for accomplishing a task. Within the context of computer science, algorithms take the form of computer programs, and are essentially the language with which we tell computers what we want them to do and how they should do it. Therefore, in lay language, one could say that there is a problem-solving process at the foundation of computer science. The complexity and analytic thinking involved in this process is valuable to know within as well as across an increasing number of professions. A "users’ guide" for Stanford University computer science majors describes how computer science is a remarkably young field, yet a revolutionary one: It was just over fifty years ago that the first electronic computers were developed, and there was no recognition at the time of computer science as a field of study separate from electrical engineering or mathematics. Over time, as computers became increasingly powerful and were applied to more and more tasks, people began to realize that the task of programming those computers to solve problems was an extremely difficult problem requiring theories and practice unlike those used in existing fields. Computer science—the science of solving problems with the aid of a computer—became a new discipline in its own right. Computer science is not just about building computers or writing computer programs (we call this programming, or coding). In fact, computer science is no more about building computers and developing software than astronomy is about building telescopes, biology is about building microscopes, and music is about building instruments. It is about how we use such tools, and what we find out when we do. The solution of many computer science problems may not even require the use of computers -- just pencil and paper. As a matter of fact, problems in computer science have been tackled decades before computers were even built. 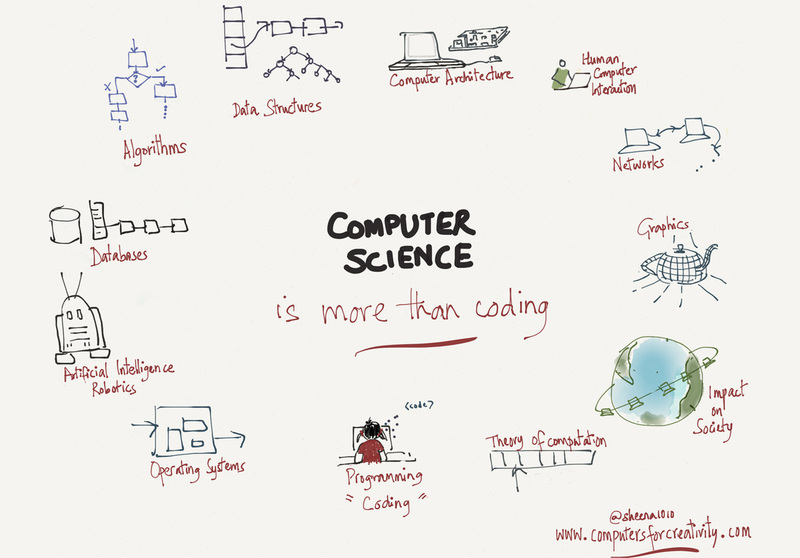 CS does involve coding, but it also involves much, much, much more. View explanations of computer science (and reasons to teach CS) as a slide deck or one-pager.